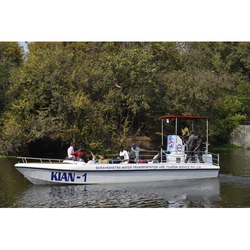 Leading Manufacturer of 25 seater catamaran boat with 25hp obm, luxury double decker tourist boat, speed boat 4 seater without obm, frp 20 seater high speed boat with jet propulsion, catamaran luxury 60-80 seater cruise boat and swamp motor air boat from Pune. 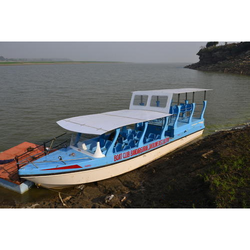 We manufacture Fibre Reinforced Plastic (FRP) Luxury Tourist Double Decker Boat of 60 Passenger capacity which is suitable for sea, river and lake. The main features are : ‘V’ hull shape, Single Piece Mould and Job, 15.5 Mtr Length and 4.6 Mtr width. The Boat can comfortably cruise at a speed of 15 knots and the steering system is hydraulic. 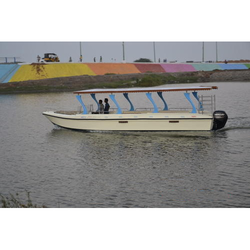 This multipurpose boat can be used for tourist activities, for corporate to conduct seminars, conferences and meetings, for outing with family and friends, for water transport activities, as work boat for carrying goods etc. Bed rooms can also be built on the hull to facilitate private trips also. Variants of this model can be built according to customer requirements with VIP seats, furnishings and air-conditioned luxury rooms. 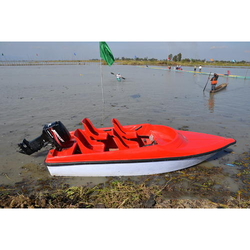 FRP Speedboats are manufactured from Marine grade FRP, with suitably contoured ‘V’ shaped hull to obtain high speed even in rough and choppy water. The boats are totally impermeable and are unaffected by long exposure to sunlight and weather conditions. Suitably strengthened and provided with rubber fenders along the sides, the boat is protected against chafe, rendering them high on safety and performance. The hull is foam-filled and thus unsinkable. With a wide body and a low center of gravity, a boat is very stable. We have manufactured a luxury Speed Boat of 20 seaters having sofa seat arrangement. The seating arrangements can be made as per customer requirement and choices. This can run with a 60hp 2 Stroke OBM. In the month of July 2017, we have launched our Catamaran Luxury 60 seater Cruise boat in our Pune Factory. This is the first time in India where a Cruise boat has been manufactured using latest Vacuum technology i.e. Vaccum Infusion and Vacuum Bag with Epoxy Resin. Vacuum Technology itself means that the boat is of lightweight but has got very high strength. Luxury seats are been used for the comfort of the tourists. Attached toilets and pantry area are the additional facilities in the Cruise boat. Swamp (Air) Boat is widely used in the USA by tourism sector for taking the tourists to the creek and marshy land areas where conventional boats could not reach or denied access by nature. We are happy to announce that we have successfully developed Swamp Boat in Fibreglass for the first time in India and have supplied 2 boats to Jammu & Kashmir Police in 2005 and 6 nos to Northern Command, Jammu for their various units and are performing well. 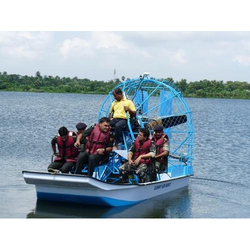 Swamp (Air) Boat can be effectively employed in Wild Life sanctuaries, Crocodile dominated areas, Dolphin dominated areas, Creek areas (e.g. Kutch, Gujarat) etc. It is ideal for adventure savvy tourists who like to go to interior creeks and marshy lands. Swamp boat is a watercraft, which has an air propulsion system, i.e., it has a propeller which pushes air to the rear and provides the thrust to drive the craft forward. Since no part of the propulsion system is underwater, the airboat can be operated easily in water with a depth of only a few centimeters. The Swamp Boat consists of the flat-bottomed boat which skims over the water surface instead of cutting through it like a conventional displacement hull. This allows it to attain high speeds by riding on a cushion of air and water. A pair of rudders behind the propeller enables direction control. The ideal environment for the Swamp is shallow, chocked, hyacinth infested rivers, lakes, and swamps that restrict movement of conventional boats because their underwater propellers get entangled and damaged, due to the undergrowth. Enjoy the ride in a RIVER BUS!! 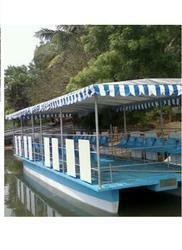 Yes, we have developed a product named "ECO - FRIENDLY RIVER BUS" made fully in Fibre glass. It can be propelled with a 40 HP OBM and the speed is 20 Km/hr with 30 passengers + driver and the buoyancy is 5000 Kg. 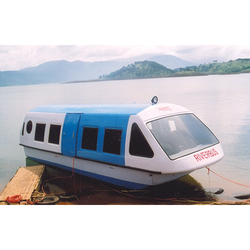 The design and drawings of hull of River Bus are approved by Indian Register of Shipping ( IRS ). Fully Air Conditioned, Luxury Seats, Uphlostry Linings, 32 Fans, Lights, Refrigerator, Generator Etc. And More. As Per Customer Requirements. All Tourism Departments, - Wild Life Sanctuaries, - Lakes, Rivers and Dams, - and Anywhere Except Sea. 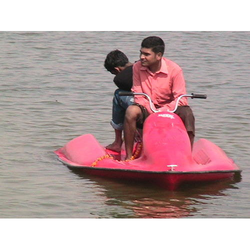 We have successfully designed, developed and manufactured the electric powered eco-friendly boat in our company. 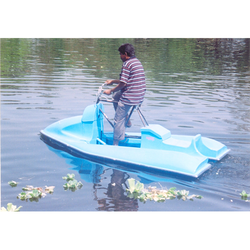 The electric boats are noiseless, vibration free and do not pollute the environment. Fitted with rechargeable batteries, these boats can run for 6 hours on one single charge. 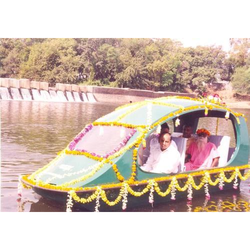 Eco- Tourism focuses on the enjoyment of nature without destroying it, hence the electric boats are becoming very popular in eco-tourism. 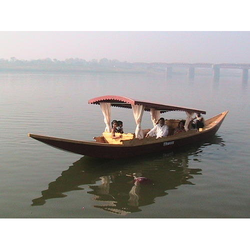 Boats are driven with conventional engine release effluents into the water beside creating noise pollution. The vibrations of an engine used in such boats transmit to the body of the boats and reduce its life. These disadvantages are overcome in the electric boat. Free Hybrid Energy System of Rechargeable Batteries drive the motors of the Electric Boat, rendering the operation of the boat absolutely noiseless and vibration free. The operating cost is very nominal compared to that of conventional boats. 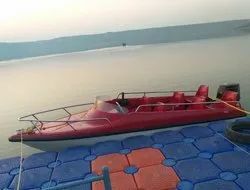 This type of boat would be most suitable for use in bird and wildlife sanctuaries for sightseeing without disturbing the animals and the birds, especially in clean lakes where the use of Outboard Motors / Inboard Diesel Engines are prohibited. The boats were made of Fibre Glass, it does have a very long life. The batteries are of reputed make and are guaranteed for two years. The conventional Kashmiri Shikkara is re-created in Fibreglass for the first time in India in our factory with the same wooden look and finish without losing the elegance and flavor of wooden Kashmiri Shikkara!! The hull of FRP Shikkara is a single piece made out from a single mold. The interior of the boat is paneled with pinewood and the floor is also wooden. The FRP Shikkara Boat is provided with cushion seats and bed; side curtains are provided for privacy for family and couples. The wooden floor is easily detachable and could be removed during the rainy season. 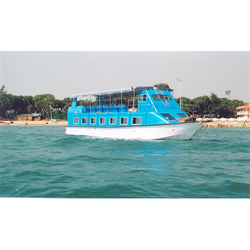 The boat is ideal for pleasure trip for a family and provides total stability and safety for the tourists. It is an essential item for all tourism departments for providing pleasure trips to families with an affordable budget. UV Self -Pigmented Gelcoat, Fibreglass, Isophthalic Marine Grade Resin with PVC Foam Core sandwich construction. It is having the same flavor of wooden Kashmiri Shikkara. The hull of Shikkara is made out of FRP and the floor is paneled with pine wood finish. 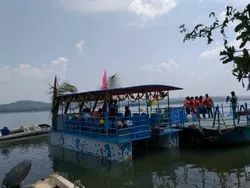 The boat is provided with arrangements for fitment of out-board motor, cabling, forward reverse throttle, steering wheel etc., and is fitted with comfortable cushioned seats, which could be upholstered to individual choices. 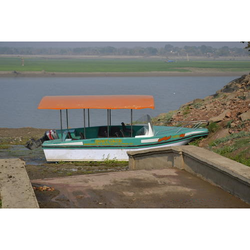 These boats are ideally best suited for Tourism Departments and for River navigation and is specially designed and developed to enjoy the adventure sports and for Rescue operations as well. The Boats are fitted with Remote Control Steering system and forward reverse in front of the Boat to control the OBM. Construction: FRP- UV Self-Pigmented gel coat, Fiber glass, Isophthaalic Marine Grade Resign ,Chopped Strand Mat, Polyurethane foam, Teakwood in transom and highly stressed areas , additional layers at keel ,chine and transom sandwich Construction with PVC Core Vacuum Infusion System. Fender: Rubber fender mounted in SS rails will be provided at the port and starboard sides of the boat to prevent abrasion while going along side of jetty or other vessels.8 No’s Mooring Fenders with eyelets on both sides and with appropriate rope will be supplied. Optional: Wind screen wiper, Driver door (Port side), GPS Navigation system. UV self pigmented marine Grade Isophthalic Gel coat, Marin Grade Isophthalic resin, Additional Layers at Keel, Chine and transom. Sandwich construction with PVC core vacuum infusion System. Fittings with sun and wind guard. It is a new concept developed by us for entertainment along with the promotion of health through “exercise in the water” at home. Yes, you can do cycling in your own swimming pool/tank at your home!! It can be put into water bodies such as rivers, lakes, ponds and swimming pools. It is definitely an attraction for all the tourist centers and is affordable to all categories of tourists. The strength of the hull derived from the composite materials gives a tough competition to the wooden boat and being in FRP, maintenance level is very minimum. Superstructure of the boat of different designs, various types and capacities are built according to the customer needs and requirements. Maintenance Free : Being in Frp, Maintenance of Boat Is Very Minimal, Say 2 to 3 %, Compared to Wooden Boats. Super Structure of the Boat Will Be Sprayed With Special Protective Coatings to Save From Excessive Sun Rays and Rains Which Damages the Bamboo and Cane. 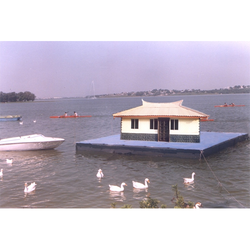 100% Pollution Free : the Frp House Boat Is Free From All Pollutions, Be It Air, Water or Land. Human Secretion Is Collected Into a Specially Designed Tank, Sucked and Disposed in Land Into a Filter Tank for Scientific Process . Not a Single Drop of Waste Is Diverted Into Water. 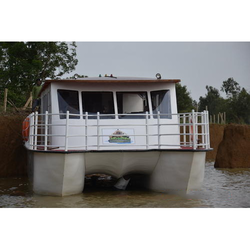 100% Eco Friendly : the Frp House Boat Is 100% Eco Friendly Due to Its Non- Pollutant Nature. The Engine Does Not Emit Oil or Any Wastage in Water. Safe and Scientific Disposal of Human Secretion Ensures That the Water Is Totally Clean and Pure. For Hot Water and Lights, Solar Energy Can Be Tapped by Fitting Solar Panels. Hall on Top : a Spacious Hall Is Constructed on the Top of the Boat Which Can Accommodate Upto 250 Persons Which Is Ideal for Conducting Parties, Conference, Meetings Etc.etc. 40 HP OBM (Mercury/ Mariner) 4 Stroke EFI with wired Remote Control System. 40 HP OBM (Mercury/ Mariner) 4 Stroke EFI with wired Remote Control System. Catamaran Tourist Boat is very stable and safe and it can run with 9.9 HP OBM with 20 persons and the boat can be built according to customer requirements. Canopy is provided with the boat. 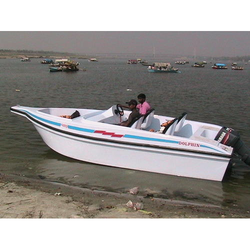 FRP Speed boats are manufactured from Marine grade FRP, with suitably contoured ‘V’ shaped hull to obtain high speed even in rough and choppy water. The boats are totally impermeable and are unaffected by long exposure to sunlight and weather conditions. Suitably strengthened and provided with rubber fenders along the sides, the boat is protected against chafe, rendering them high on safety and performance. The hull is foam-filled and thus unsinkable. With a wide body and a low centre of gravity, boat is very stable. We have launched our Luxury 10 seater High Speed boat with 250hp OBM. Looking for Tourism Boats ?